A gnat is any of many species of tiny flying insects in the Dipterid suborder Nematocera, especially those in the families Mycetophilidae, Anisopodidae and Sciaridae. In British English the term applies particularly to Nematocerans of the family Culicidae. The common gnat is the species Culex pipiens. Male gnats often assemble in large mating swarms or ghosts, particularly at dusk. Gnat larvae are mostly free-living and some are aquatic. Many feed on plants, though some are carnivorous. Larval plant feeders (such as the Hessian fly larva) cause root, stem, or leaf galls to be formed by the host plant. Some species of fungus gnats (families Mycetophilidae and Sciaridae) are pests of mushrooms and roots of potted plants in homes and greenhouses. Some South American Pleurothallid orchids are pollinated by tiny gnats and have correspondingly small flowers. The Chloropidae are a family of flies commonly known as fruit flies or grass flies. About 2000 described species are in over 160 genera distributed worldwide. These are usually very small flies, yellow or black and appearing shiny due to the virtual absence of any hairs. The majority of the larvae are phytophagous, mainly on grasses, and can be major pests of cereals. However, parasitic and predatory species are known. A few species are kleptoparasites. Some species in the genera Hippelates and Siphunculina (S. funicola being quite well known in Asia) are called eye gnats or eye flies for their habit of being attracted to eyes. They feed on lachrymal secretions and other body fluids of various animals, including humans. There are scant records of chloropids from amber deposits, mostly from the Eocene and Oligocene periods although some material may suggest the family dates back to the Cretaceous or earlier. The Sciaridae are a family of flies, commonly known as dark-winged fungus gnats. Commonly found in moist environments, they are known to be a pest of mushroom farms and are commonly found in household plant pots. This is one of the least studied of the large Diptera families, probably due to the small size of these insects and the difficulty in specific identification. Currently, around 1700 species are described, but an estimated 20,000 species are estimated to be awaiting discovery, mainly in the tropics. More than 600 species are known from Europe. These gnats are small, from one to at the very most seven millimetres long. They have slender, darkly colored bodies and dark wings. However, the females of several species are wingless. Their long legs and antennae with eight to 16 segments are typical of many gnats. Sciarid flies are common pests of mushroom houses and of plants grown in protected culture, for example herbs, where the warm and moist conditions favour their rapid development. In commercial mushroom houses, sciarid fly larvae tunnel into the stalks of the mushrooms, and feeding damage can sever developing mycelium, causing mushrooms to become brown and leathery. Their faeces may also prevent the mycelium from colonising the casing layer, severely reducing yields. As a pest of plants, sciarid larvae feed on the root system. In both industries, adult sciarid flies are a nuisance pest that can result in crop rejection if high numbers are present in the growing area. The damaging larval stage can be controlled using the beneficial nematode Steinernema feltiae, which enters the larva and releases a bacterium that kills the insect. The nematode then reproduces within the larva and its young are released into the growing medium, where they actively search out new host larvae. Sandfly (or sand fly) is a colloquial name for any species or genus of flying, biting, blood-sucking Dipteran encountered in sandy areas. In the United States, sandfly may refer to certain horse flies that are also known as “greenheads” (family Tabanidae), or to members of the family Ceratopogonidae, also known in Florida and elsewhere as a sand gnat, sandflea, no-see-um (no-see-em, noseeum), granny nipper, chitra, punkie, or punky. Outside the United States, sandfly may refer to members of the subfamily Phlebotominae within the Psychodidae. Biting midges are sometimes incorrectly referred to as sand flies. Biting midges, also known as no-see-ums (no-see-em, noseeum), are insects that belong to a different biological group and should not be confused with the sandflies. Enicocephalidae, also called unique-headed bug and gnat bug, are a family of 130 species of the suborder heteroptera. They are typically 4 mm long, and found throughout the world. They have an elongated head, constricted in places, hence its head is ‘unique’. Cecidomyiidae (sometimes spelled Cecidomyidae) is a family of flies (order Diptera) known as gall midges or gall gnats. As the name implies, the larvae of most gall midges feed within plant tissue, creating abnormal plant growths called galls. Cecidomyiidae are very fragile small insects usually only 2–3 mm in length; many are less than 1 mm long. They are characterised by hairy wings, unusual in the order Diptera, and have long antennae. More than 3000 species are found worldwide, but since 1,100 are from well-studied North America, this may be an underestimate. Many are economically significant especially the Hessian fly, a wheat pest, as the galls cause severe damage. Other important pests of this family are the lentil flower midge (Contarinia lentis), the lucerne flower midge (C. medicaginis) and the alfalfa sprout midge (Dasineura ignorata) on the Leguminosae; the swede midge (Contarinia nasturtii) and the brassica pod midge (Dasineura brassicae) on the Cruciferae; the pear midge (Contarinia pyrivora) and the raspberry cane midge (Resseliella theobaldi) on fruit crops; and the rosette gall midge (Rhopalomyia solidaginis) on goldenrod stalks. Ceratopogonidae, or biting midges (including what are called, in the United States and Canada, no-see-ums, midgies, sand flies, punkies, and others), are a family of small flies (1–4 mm long) in the order Diptera. 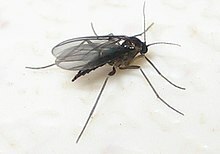 They are closely related to the Chironomidae, Simuliidae (or black flies), and Thaumaleidae. The winged bug looks just like your stock photo in the main article. It’s almost microscopic. I have to magnify it with my iPhone How do we end this? 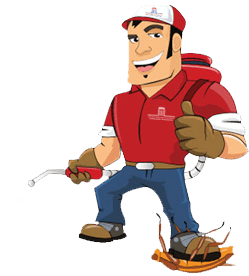 Have you considered a professional pest control person to take a look? I have no idea what kind of bug is inside my house. They are as small as a dot made by a pencil. When you touch them, they jump. After trapping a few on clear tape and looking at them with a magnifying glass, I see that their body resembles an ant but they have clear wings. I first noticed them in our bathroom, mostly after dark. They seem to like the corners of the walls or where the mirror meets the ledge. I live in SW Florida and it is “dry” season. I called our lawn company that treats the outside of the house and I was told they were probably Springbugs but what I’ve seen pictures of these critters, they don’t resemble them. Please help. This is exactly what I have discovered and am failing to find answers for. If you have any answers please share. Sorry, but they are fungus gnats. The only way to get rid of them is to keep all vegetation bagged, in the fridge, etc. That will help keep the number down. They seem to like the light so we put up sticky window traps. They seem to be seasonal (if that helps). We keep vinegar traps all over but they also seem to like whatever your drinking! LOL especially alcohol. Finally figure out they just can’t swim, so if they fall in a liquid they die. If I bring in produce (from my garden or from the grocery store) I rinse them with soapy water. I dont know what sort of bug it is but there are small, round black flies living in my college’s communal bathrooms. They are always in the shower and every time you think their gone, they come back in packs of about 10. They rarely stray from the showers and fly toward you but die easily when you spray them. Does anyone have any clue on how to rid myself of them? I’m replying/making a comment ONLY because I want to go on record that having gnats zip around one’s head, get in one’s hair, skitter on one’s scalp, crawl around one’s hairline & into one’s ear, tickle one’s neck and crawl down one’s back, even crawl up one’s pant leg or down through one’s trouser waist-all the while biting as they go over every inch of one’s body, is completely TRUE, for all of this has been happening to me for the last several weeks. They are driving me crazy while they happily dive bomb right at ME! I take them with me as I go about my apartment, accompanying me through my building into my car and into every place I go. This very personal aspect of these infuriating, nasty gnats that have invaded my home has been scoffed at by a pharmacist who I consulted, seeking a remedy early on and my hairdresser-who I asked to check my scalp (I just knew the things had taken up permanent residency in my hair) because I figured she just had to know about this phenom-told me to not trust info on the internet, that it is very unlikely that I could have gnats living in my hair/on my scalp ’cause I’m “not a piece of fruit” (my paraphrase of what she meant), checked my scalp and said it was basically clear but for a few tiny red marks on my crown (that most likely were due to my scratching at my head), making a final remark that I should wash my hair in Dawn dish liquid (regular, not ultra) if I was really worried about it, for Dawn killed fleas on dogs. Well then; So I got the Dawn, but they are still a-buzzin’ about my head and body. They actually buzz me ad nauseum while I’m standing surrounded by honey spreads, bananas and vinegar gnat traps, which they patently ignore. What’s it about me, I wonder? Anyway, this long post is aimed at those non-believers out there-even the “professionals” who deny that there can be a very personal aspect to having your home occupied by GNATS (not fruit flies, or flying ants, or other fly species, but true and nasty gnats!). Oops, forgot to add that they are indeed smart. Their behavior has changed, as evidenced by their learning that those yummy smells of banana, vinegar and honey are actually traps, which they now avoid. Why bother to try to outwit them anyway, they think; they have found me, and can usually escape my swatting hand or scratching fingers. I’ve also found several hanging about in tight spots, namely the area where 2 pieces of wood come together at a seam or joint. I’m treating my place for drain (fungus) gnats as well as those other general, all purpose gnats that love fruit, sugar, garbage (and humans beings). I just came from my vet’s office. I took two sticky dome traps with me for them to identify what bugs I caught on there. After looking at them under a microscope they said, “those are only gnats. They have wings and any bug with wings is not a parasite/biter. I have been bitten for six months and diagnosed with “arthropod bite reaction.” I am scarred on my forearms and lower legs. The bites last for months and I’m suffering. I don’t have the money for an exterminator. My biggest question is the difference in information about gnats from the vet and your web site. Do they or don’t they bite? To the people that get followed by gnats and even bit: I heard or read that WE are lacking a mineral which makes us sweet to these pests that is why they are drawn to us. I am not sure about the mineral WE are deficient in, but I am going to start taking some vitamins and minerals anyway and you should too. I am beyond sick of these annoying gnats biting and following me driving me crazy! Let’s see if it works! Good luck! Help! Gnats are following me everywhere I go…. a few months ago a few tiny tanish bug fell out of my hair and I’m not sure if they grew up and became these annoying gnats, but for days and weeks they have followed me around I feel like I’m crazy seeing them but other people see them too. They are small and tinted red if you have any info for me let me know please. Also my head Itches but it is not lice and I’ve checked it isn’t lice maybe it is the gnat biting my head or maybe I’m going crazy please let me know ASAP thanks! how do these tiny things get in the house in the first place ? what drew them into my house ? These tiny things have been in my house for 6 to 8 weeks now. I thought they were bed bugs but exterminator says no. I am thinking now they’re some sort of gnats that are biting us. They are tiny black things flying around in the house. I don’t know how or where they even came from or why in my house ? I put bananna all over my hair to conditioner it. I felt bugs crawling in my hair an hour later. What a thrill it was!!!!!! Then i put the banana up my that and drew as many critters as I could to me!!!! What are these wonderful things!!! ?